What is 2-step log in? By adding a second step to the log in process, we can ensure that anyone logging into your account is actually you! Malicious attackers will not only need your password, but also access to your mobile device, in order to log into your account. 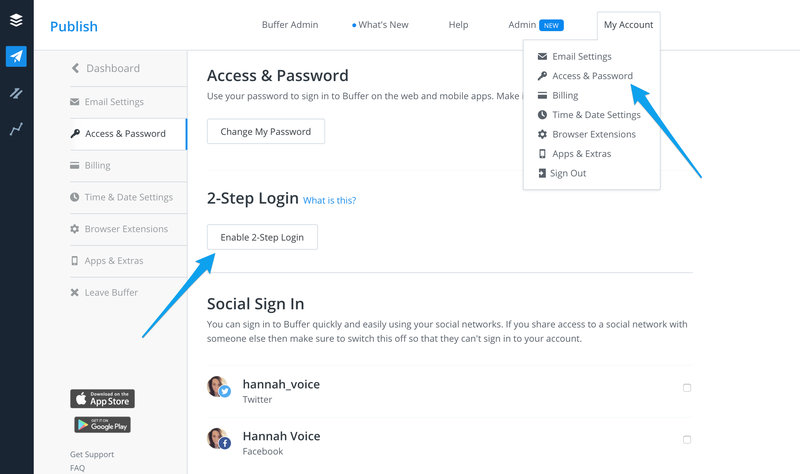 Log into your Buffer Publish account and click on My Account, followed by Access & Password. Under the 2-Step Login heading, click Enable 2-Step Login. A pop-up will appear. Select Text Message (SMS) and click Next. 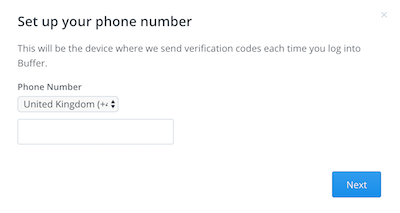 Enter your phone number, ensuring you have the correct country code selected, and click Next. You'll then receive a 6 digit code to your phone. Enter this code and click Submit. 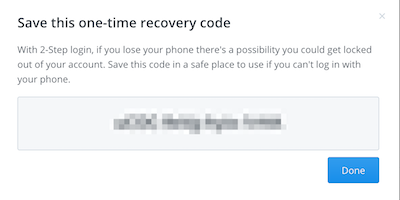 If you lose your phone, there's a possibility you could get locked out of your Buffer Publish account. Copy and save this code in a safe place, so you can use it later if you're not able to log in with your phone. Finally, click Done and you should be all set! 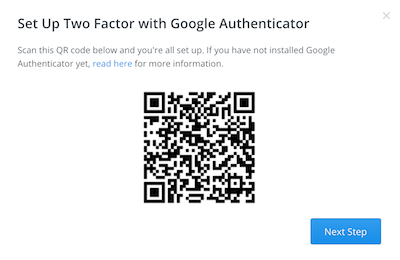 You will need to have Google Authenticator installed on your iOS or Android device. You can find information on this here. A pop-up will appear. Select Google Authenticator and click Next. Open Google Authenticator on your phone and scan the QR code. Then, click Next Step. Once scanned, Google Authenticator will display a 6 digit code. Enter this code and click Submit.